Poll • Majority of Westerners oppose federal lands transfer to states, survey indicates. 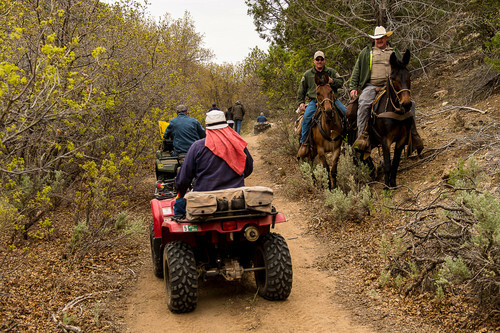 Trent Nelson | The Salt Lake Tribune Mounted law enforcement officers move off the trail as motorized vehicles make their way through Recapture Canyon, which has been closed to motorized use since 2007. San Juan County Commissioner Phil Lyman is among five Utahns charged Wednesday with conspiracy in connection with a May 10 ATV ride into Recapture Canyon protesting federal oversight of public land. The BLM had closed this canyon outside Blanding to protect its archaeological resources from motorized use. About 50 people rode into the canyon that day, but only those suspected of organizing or promoting the event were charged. Utah is the only state in the west where voters want to take over federal lands, according to a new poll. While many westerners may view their state governments more favorably than they view the feds, a majority oppose transferring public lands to the states, a survey released Thursday by the Center for American Progress found. By a 52-42 margin, residents of eight intermountain states said they opposed taking over federal lands in their states, despite their frustrations with federal government gridlock. In Utah however, those numbers are flipped, with 52 percent of those polled supporting the idea of a transfer and 40 percent opposed. The idea is popular among conservatives and enshrined in a Utah law demanding the federal government hand over 30 million acres by the end of this year. But the Beehive State seems to be an outlier. "Western voters are telling us that they are using these places. They are having positive experiences and they don&apos;t see a big difference when they visit state lands," said pollster Lori Weigel of Public Opinion Strategies. David Metz, president of the Democratic polling firm FM3 said westerners&apos; feelings on the issue were intense. Just 19 percent strongly support a transfer, while 31 percent strongly oppose the federal-state exchange. Pollsters interviewed 200 voters in each of eight western states between Sept. 10 and 14. The Center for American Progress, a left-leaning think tank, commissioned FM3 and Republican pollster Public Opinion Strategies to conduct the survey. Each of the states  Utah, Nevada, Oregon, Idaho, Montana, Colorado, Wyoming and New Mexico  have large land blocks managed by federal agencies such as the Bureau of Land Management, U.S. Forest Service, National Park Service and U.S. Fish and Wildlife Service. While Utah adopted its land transfer law two years ago, similar legislation is under way in other states. Legislators in Montana, Nevada and Idaho are considering similar measures. The New Mexico legislature rejected a bill, while Arizona&apos;s governor vetoed another passed by lawmakers. Arizona was not included in the polled states. Critics say the land transfer has lost its appeal among those who enjoy visiting public lands. "These lands belong to all of us, and it is imperative that we keep it that way," Heinrich told reporters on a press call Thursday. "Efforts to seize or sell off millions of acres of federal public lands throughout the West would bring a proliferation of closed gates and no trespassing signs in places that have been open and used for generations. "These privatization schemes would devastate outdoor traditions such as hunting and fishing that are among the pillars of Western culture and a thriving outdoor recreation economy," he added. Utah Rep. Ken Ivory, the West Jordan legislator who sponsored Utah&apos;s land-transfer law in 2012 and continues to advocate for the exchange, did not respond to an e-mail asking for comment Thursday. The survey found most voters had favorable views of federal land agencies. But those feelings were somewhat muted for the BLM, which garnered a 48 percent approval rate. "For the most part, they approve of the job the federal agencies are doing managing these lands," Weigel said. "That view is broad-based and widespread."